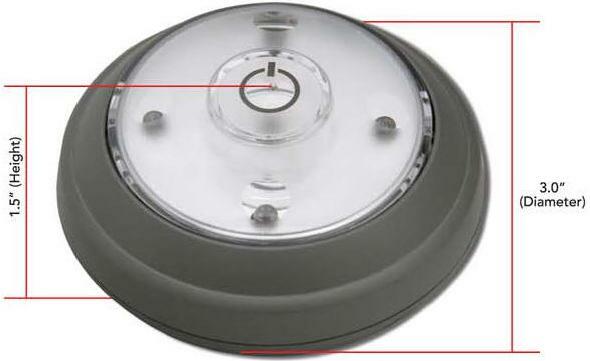 The ritelite ™ Wireless (round) LED Lights are great during power outages. Each light has Five (5) super bright LED's that last up to 100,000 hours. Each light requires only three (3) AAA batteries (not included). There are no wires and no plugs. 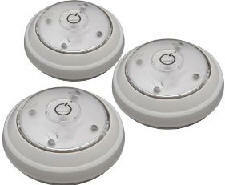 These LED lights are perfect backup lighting for important areas of your home. Also a great way to add accent lighting wherever you need it - without wires. No Wires, No plugs - Each light runs on 3 AAA batteries (not included). Five (5) Super Bright White LED's provide bright light anywhere you need it. Light Head conveniently swivels and pivots to provide light directly where you need it. One Touch ON/OFF/DIMMER Operation - Press once for full brightness. Press again for softer light. Press a third time to turn the light off. Installs easily with hook and loop tape (included), or screws (included). Two (2) year Limited Manufacturer Warranty and Owners Manual included. Patents Pending, Made in China.